The arithmetic mean is the average of a groups of numbers. It is what most people think of when they hear the word "average." For each value of x and y, the mean of the variable is subtracted from the value and then the product of the 2 values is calculated. The covariance is the average of the products. The correlation coefficient is often denoted by the letter r. It is also referred to as the Pearson correlation coefficient. 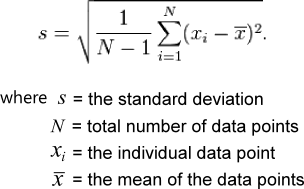 The coefficient of determination is the square of the correlation coefficient. It is often denoted as r². r² always lies between 0 and 1. If x and y are perfectly related, meaning all the variance in y can be explained by x, then r² will equal 1. If x and y are completely unrelated, then x will explain none of the variance of y, and r² will be 0. The log-rank test can be used to analyze covariates by stratifying data across each covariate. If there are many covariates and strata, or if a covariate is continuous, then the log-rank test is less powerful, and the cox proportional-hazard is preferred. Medical conditions - diabetic vs nondiabetic, hypertensive vs nonhypertensive, etc. The difference between 2 and 4 is two points, and the difference between 8 and 10 is two points. Even though the difference is the same, there is no way to prove that the two point difference has a consistent and meaningful value across the entire scale. Furthermore, people perceive pain differently, so a pain score of 5 for one patient may be a 3 for another patient. The scale has no uniformity across subjects. An example of interval data is temperature. The difference between 90° and 100° is 10°. The difference between 40° and 50° is 10°. This difference of 10° has numerical meaning and can be measured consistently across the entire scale. The set point of 0° however, is arbitrary. Zero degrees has a different meaning across different scales (Fahrenheit, Celsius, Kelvin). 100° is not twice as hot as 50° because 0° is arbitrary. For example, if a set point of 200° had been chosen instead of 0°, then 300° (200° + 100°) would not be twice as hot as 250° (200° + 50°). This distinction is what sets interval data apart from ratio data. Because zero is arbitrary, their ratios cannot be compared. An example of ratio data is weight. Differences between weights have numerical meaning and can be measured consistently across the entire scale. Zero weight has a consistent meaning across different measures of weight (pounds, kilograms, etc.). Because zero is not arbitrary, weight ratios have meaning and can be compared. For example, 20 pounds is twice as much as 10 pounds, and so on. 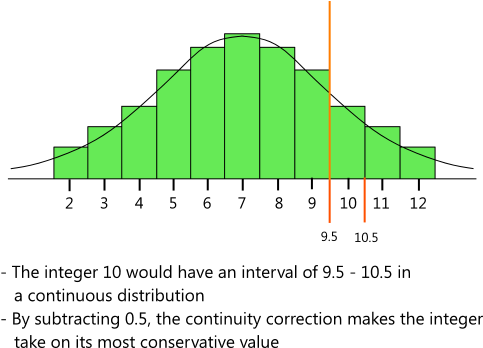 The F distribution is a continuous distribution that is used to compare the variance of two or more samples. The test statistic for an F distribution is derived from a ratio of the variances. The shape of the F distribution varies depending on the degrees of freedom (df) in the two samples. Because the test statistic is a ratio, the degrees of freedom (df) are expressed as numerator df and denominator df. The F distribution is mostly used in ANOVA testing that involves 3 or more samples. It can also be used to compare the variance of two samples and to compare regression models for goodness of fit. If a contingency table is constructed from a set of data, and one of the cells has a value < 5, then Fisher's exact test is often used to determine the probability of the observed table. It can also be used for any set of data, regardless of the cell count. Fisher's exact test uses the hypergeometric distribution. The hypergeometric distribution assumes that each observation is not independent because the number of successes in the population is fixed. 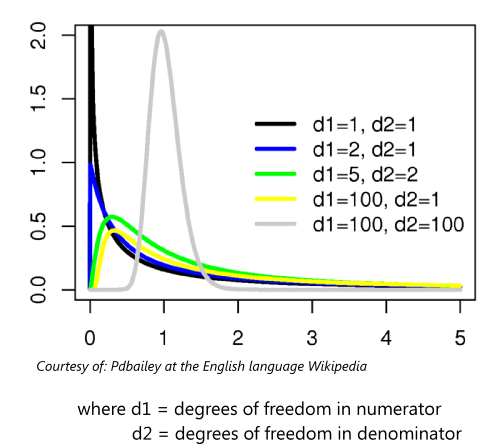 This means after one success is selected, the probability of the next selection being a success is lowered. For example, if a population of 16 has 9 successes, then the probability of selecting a success is 9/16. After one success is selected, the probability of selecting a success then becomes 8/15. "The geometric mean can give a meaningful "average" to compare two companies which are each rated at 0 to 5 for their environmental sustainability, and are rated at 0 to 100 for their financial viability. If an arithmetic mean was used instead of a geometric mean, the financial viability is given more weight because its numeric range is larger- so a small percentage change in the financial rating (e.g. going from 80 to 90) makes a much larger difference in the arithmetic mean than a large percentage change in environmental sustainability (e.g. going from 2 to 5). The use of a geometric mean "normalizes" the ranges being averaged, so that no range dominates the weighting, and a given percentage change in any of the properties has the same effect on the geometric mean. So, a 20% change in environmental sustainability from 4 to 4.8 has the same effect on the geometric mean as a 20% change in financial viability from 60 to 72. The geometric mean can be understood in terms of geometry. The geometric mean of two numbers, a and b, is the length of one side of a square whose area is equal to the area of a rectangle with sides of lengths a and b." One group is typically given an intervention, and the other groups is not (control). The two groups are then followed for a period of time and the incidence of death in each group is measured. The two groups are then compared to each other. 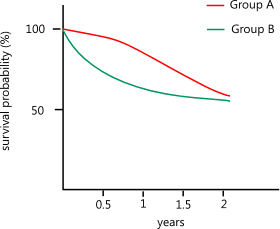 Survival curves are not limited to comparing mortality. They are also frequently used to compare the occurrence of an event (ex. heart attack, cancer recurrence) between two groups. 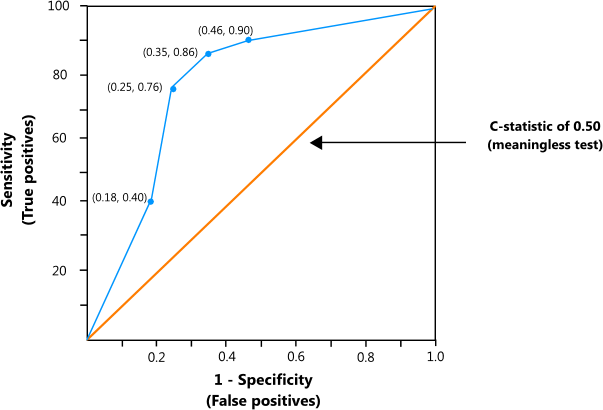 To construct a Kaplan-Meier survival curve, a group of subjects is followed for a period of time. The time period is then divided into intervals (ex. day, month, etc.) The probability of surviving to each consecutive interval is then calculated. Subjects who drop out of the study are called "censored." They are considered noninformative and assumed to have the same underlying survival curve as the uncensored subjects. In our examples, censored subjects are also assumed to have survived up to the end of the interval in which they were censored. There are are calculations that make other assumptions. 3. Divide the time period they were followed into intervals. NOTE: Intervals do not have to be equal lengths. Typically, a new time period begins with each subsequent death (or event). If the study is very large, then the intervals may be divided into days, weeks, or months. 4. For each interval, calculate the probability of survival. Subjects who are censored during an interval are considered to have survived to the beginning of the interval, but are not counted in the actual interval where they were censored. NOTE: There are other methods of addressing censored subjects which doesn't follow this exactly. It's important to make sure that the time point makes sense and that it was clearly defined before the trial was performed. Selecting time points post hoc can lead to problems, because investigators may look at survival curves and select time points where they know the curves are significantly different. A contingency table like the one below is then constructed for each strata. The order of the rows and columns does not matter. The expected outcome for cell a is calculated by taking the proportion of patients in the first row and multiplying it by the proportion of patients in the first column. This product is then multiplied by the total number of patients. These values are then summed across all tables. The 0.5 that is subtracted from the numerator in the Mantel-Haenszel test is called a "continuity correction." Some statisticians use it while others do not. It reduces the test statistic so that a significant results is harder to achieve. 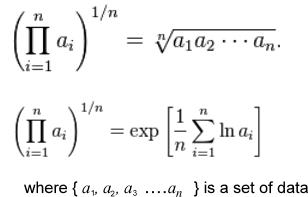 The reasoning behind the continuity correction is that a binomial outcome can only take on an integer value, but a chi-squared distribution approximates a continuous distribution. 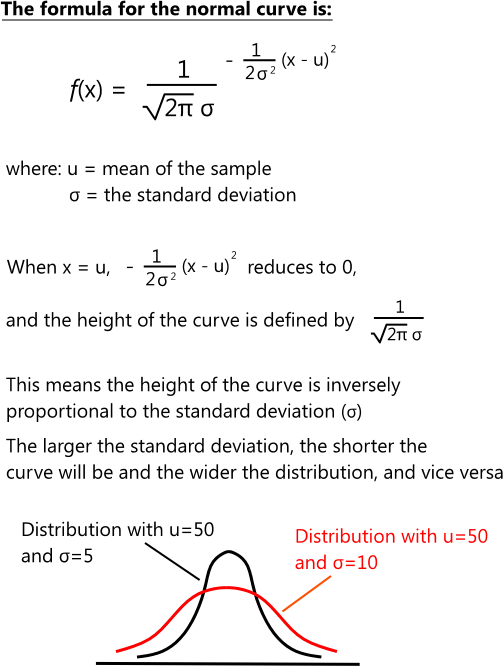 By subtracting 0.5 from the numerator, the numerator then assume the most conservative value for the integer in a continuous distribution. It is also called the "Gaussian distribution" (after the mathematician who developed it, Karl Friedrich Gauss) and the "bell-shaped curve." 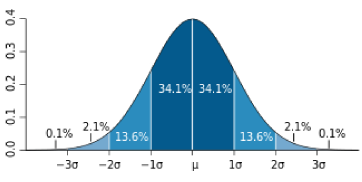 When the mean is 0 and the standard deviation is 1, the normal distribution is called the "standard normal curve"
The theory behind the normal distribution is that when a variable is sampled randomly from a population, the value of the variable will vary from individual to individual. Random factors will influence the variable with some pushing it higher, and some pushing it lower. If enough measurements are taken, the frequency distribution of the values will assume the shape of the normal curve. Distributions that are not normal can also be transformed so that they are approximately normal. For example, some factors affect a variable in a multiplicative manner. This can cause distributions that are skewed. By taking the logarithm of the values, the distribution will often be transformed into a normal distribution. Parametric statistics is statistical tests that are performed on parametric data. The name comes from the fact that parametric data is sampled from a population that has an assumed set of "parameters." Parametric data can be converted to nonparametric data and nonparametric statistical tests can be performed on the data. The opposite is not true. In most cases, a positional metric like the median is preferred when working with nonparametric data. Nonparametric data intervals have no inherent meaning so metrics like the mean do not have consistent and meaningful value. In statistics, ROC curves are typically used to quantify the predictive value of a screening test or screening criteria. ROC curves are useful when the screening test has a continuous distribution or if a set of screening criteria are being tested. 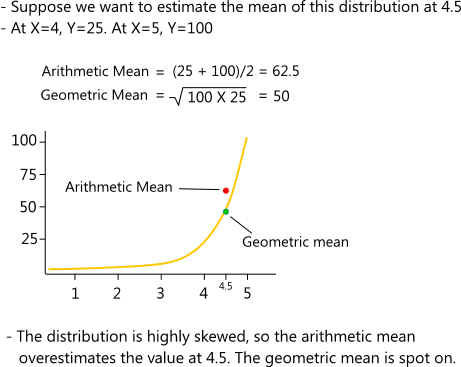 A ROC curve is a plot of the Sensitivity of a test (y-axis) vs 1 - Specificity of a test (x-axis). It can also be thought of as a plot of true positives (sensitivity) vs false positives (1 - specificity). The area under the ROC curve (also called the "C statistic") is defined as the probability that a person with the condition will have a higher score (or greater criteria) when compared to someone without the condition. A test with an area of 0.50 would have no meaning since it would equate to a 50% probability of having the condition. The greater the ROC curve area, the better the test is at predicting a condition. The table below gives generally accepted ranges for interpreting ROC curve areas. The ROC curve areas of two different tests can also be compared to determine if one test is significantly better than the other (see example below). They recruit 1000 subjects and measure their values for each criteria. They then perform a heart catheterizations on every subject to determine if they have heart disease. Another ROC curve is constructed from data that did not include the CAC score. The area under this ROC curve is 0.69. The standard deviation is a measure of spread. A group of data that have a wide range of values will have a larger standard deviation when compared to a group of data that has a narrow range of values.